“Though they are neighbors, the Denver Public Library, the Denver Art Museum and the Colorado History Museum rarely cooperate on programs — but Allen True’s West, highlighting the career of one of Denver’s most important artists, was one of those rare win-win-win collaborations. 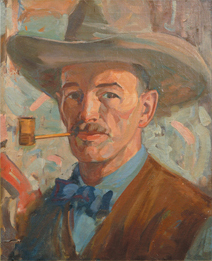 True’s chosen subject was the way the American West was rapidly changing before his eyes, and the trajectory of his career led him from charming book illustrations (shown at the DPL) to powerful easel paintings (at the DAM) to the most significant work of his lifetime, his stunning murals (at the CHM). It took a lot of walking to see it all, but given the high quality of True’s work on display, the extra effort was definitely worth it.